Each year, Universum surveys students to find out which potential employers they consider most attractive. For the 12th year in a row LVMH figures first among French students at business and management schools. This ranking is the result of a dynamic and innovative human resources policy that actively engages with young talents. 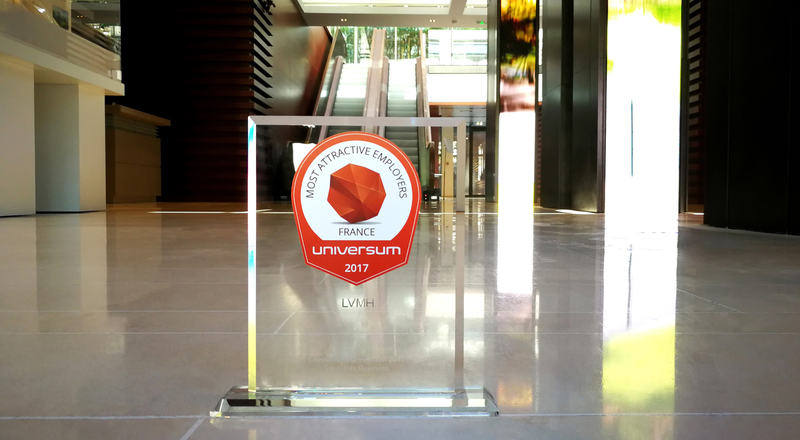 Universum has announced the results of its annual ranking of French companies considered the most desirable employers by students at business and engineering schools. More than 40,000 students completed a questionnaire covering their profile, experience, career objectives and lifestyle aspirations, and chose the employer they believe is the best match. LVMH was voted most attractive employer against these different criteria for the 12th consecutive year by students at French business and management schools, increasing its lead over the next companies in the ranking with 22.40% of the votes by future managers vs. 21.69% in 2016. LVMH also moved up one spot in the ranking by engineering school students. These results confirm the attractiveness of the LVMH Group and its Maisons, recognizing the effectiveness of our recruitment and talent development policy. Over 200 events were held in 2016 to engage with students. “We are both delighted and proud to once again receive this mark of confidence from students. This recognition will continue to motivate us, as always, to strive for excellence and remain faithful to our promise of a stimulating work environment with international perspectives, anchored in the compelling values of innovation, creativity and entrepreneurial spirit. Our ecosystem of 70 Maisons offers unique career opportunities,” said Chantal Gaemperle, LVMH Group Executive Vice President, Human Resources and Synergies. This latest distinction recognizes the proactive initiatives to attract talented students, supported by the constant engagement of the 134,000 employees of the LVMH Group who enthusiastically share their passion for their métiers. LVMH and its Maisons reach out to students throughout the year at campus events during the LVMH Days, hosted by partner schools, including ESSEC, HEC, IFM, Polytechnique in France and Bocconi in Italy. Students are able to meet and speak with both HR managers and operational staff from Group brands to learn more about career opportunities within our unique ecosystem of 70 Houses. Among these many initiatives, the Inside LVMH event gave 220 students from French and European schools an opportunity to discover 16 LVMH Maisons. Thanks to the creative format of the event students were able to see firsthand the importance of innovation during tours of LVMH Houses and meetings with managers and staff. They also had a chance to speak with LVMH Chairman and Chief Executive Officer Bernard Arnault, who gave a memorable master class at the Fondation Louis Vuitton. Young talents are also invited to high-profile events organized by LVMH such as Les Journées Particulières or Viva Technology, the next edition of which is set for June 15-17, 2017 in Paris. Students are invited to gain firsthand experience in the luxury sector as well during internships or apprenticeships. 50% of young graduates already have a professional experience before being recruited.